I am the Detroit Tablemount. I am two and a half thousand meters under the sea. Attu Island, the edge of the USA. To my North is the East. I was over the hot spot, but I moved North. and before that I rose out of the sea as Loihi will one day. like Maui, then like O’ahu, then like Kaua’i. Then as I kept moving and wearing away, I was an atoll, a reef, a bank, a seamount. swinging to the North and continuing to where I now live. I was not the oldest, and I was not the first. Having enjoyed a great ride over the crust. 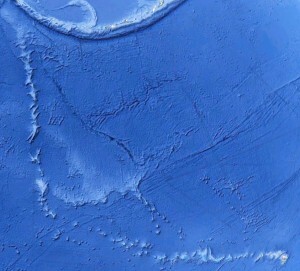 the-vu does not usually accept poetry, but who can resist a talking seamount?